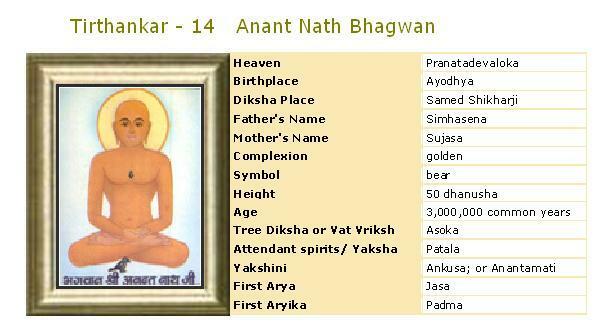 Bhagwan Anantnath dev was born in Ayodhya, on thirteenth day of the dark half of the month of Vaishaka. His father name was Sihansen and Mother name was Suyasa. After long span of life time,he took diksha 14th day of the dark half of the month of Vaishaka along with 1000 other men's. After 3years of diksha and worldly life abandonment Lord Anantnath attained (kevalgyan ) salvation on 14th of the dark half of the month of Vaishaka and constellation of Revati. On the 5th day of the bright half of the month of Chaitra, Bhagwan Anantnath, along with other 7000 saints was liberated and attained nirvana on Sammet Shikhar (mountain). Bhagwan Anantnath lived for 30 lakh years of which he spent 7.5 lakh years as an ascetics and 3 years of Meditation and Spiritual Practices (sadhana/tap). It is believed that Anantnath prabhu was 50 measure of bow(at that time unit of measurement was bow i.e. bow of bow & arrow) in height. King of Arishtha town in Dhatkikhand was well known for his beauty, personality and bravery. All beautiful ladies were his fan. But he had a bend for spiritual practices and took diksha from Acharya Chitraaksh. He had purified his soul to a high extends in his life. Because of this he reincarnated in the Pushpotar dimension of gods. It was from here that this soul traveled all the way to the Earth to the womb of Suyasha Devi and came to this Earth as a Tirthankar to achieve the ultimate freedom. It was early in the morning and the entire Ayodhya kingdom was under the heavy showers of the rain. King Simhasena was sitting in his deep thoughts and thinking about endless questions which were coming in his mind. Queen Suyasha came behind and greeted the King. Her face also revealed as if she is also carrying lots of questions in her mind. On asking, queen told the king that early that morning she saw a chain of fourteen things and since then an endless series of questions are arising in her mind. King Simhasena told that it was a sure sort sign that she was going to give birth to a son who will be the light in dark, a savior, a ruler of hearts, a spiritual leader, a person having endless knowledge and endless qualities. During the pregnancy the queen dreamt of a very long strands of beeds whose ends were not visible - endless. The power of the king also increased manifolds during the period. On the thirteenth day of the dark half of the month of Vaishakh, queen Suyasha gave birth to this great divine power. The boy was named 'Anant nath' - the endless. Time passed by and small Anantnath became Young. One day king Simhasena thought of handling over the responsibilities of the kingdom to Anantnath and go on the path meditation and Tap and try to achieve Moksha. He did the same and disappeared in the jungles. As a king King Anantnath was famous all over. Many kings came to him for advise and help. He use to solve various problems of many nations. But most of his time was spent in a place near sea shore in meditation. One day while in his deep thoughts he saw everything of his past life and that was the time he felt as if they are requesting him to take Diksha and spread the light of knowledge everywhere and do some good to the humanity. The doors of this mind opened and he realized his true purpose to come on the Earth. For the entire year from that time, he distributed wealth among the people. One day, along with thousand other kings, he came out of the palace, removed his hair with his fist, uttered, "Namo Siddhanam" and became an ascetic. After three years of spiritual practices he reached Ayodhya again and there under an Ashoka Tree he attained omniscience on the fourteenth day of the dark half of the month of Vaishakh Bhangvan Anantnath got Nirvan at Sammetshikhar on the fifth day of the bright half of the month of Chaitra.